Thanks to uneven glacial activity in the Great Lakes Basin thousands of years ago, there are about 35, 000 islands scattered throughout the five Great Lakes of Huron, Michigan, Erie, Superior, and Ontario. From tiny uninhabitable bits of floating land to one of the largest freshwater islands in the world and everything in between, here are some of the most notable of the bunch to explore the next time you feel like doing a bit of island-hopping. This second-largest island on Lake Huron in Northern Ontario is a major maple syrup production centre in the province thanks to all its maple trees, with more than a dozen family-run operations bottling the liquid gold. In addition to attractions like national historic site Fort St. Joseph and the island’s own museum, the two main communities, Richards Landing and Hilton Beach, host annual events, such as the Maple Syrup Festival, Arts at the Dock, and the Great Canadian Arts Festival to draw in tourists. Separating upper Lake Huron from Georgian Bay, this island in Ontario covers 2, 766 square kilometres and is one of the world’s largest islands in any inland body of water. The island itself contains four major rivers and more than 100 lakes, which in turn contain some islands themselves. There are tons of things to keep you busy here: camping, fishing, swimming, hunting, cycling, boating, horseback riding, and hiking are just a few options. 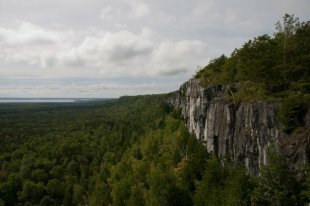 The well-known Cup and Saucer Trail has a lookout that provides a spectacular view of the island. Michipicoten Island in the northeastern part of Lake Superior is northwest of Sault Ste. Marie and southwest of Wawa, Ontario. Pronounced Mish-i-pe-cotton, this seemingly floating “Mystic Isle” has a constantly changing appearance, depending on the amount of fog in the air that day: sometimes it looks closer or further away, and some days it can appear as one island or three. This remote, uninhabited island is popular with adventurous kayakers, and there are week-long guided sea kayak trips where you can take in breathtakingly beautiful scenery and wildlife. Renowned for its locally made fudge, a fort used in the War of 1812, and a historical hotel, this island on Lake Huron belongs to the state of Michigan. The Grand Hotel has hosted the likes of Thomas Edison, Mark Twain, and five U.S. presidents, and because there is a ban on almost all motor vehicles on the island (walking and biking are encouraged), guests are transported to the hotel via horse-drawn carriage. 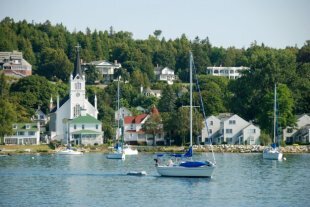 Mackinac is a popular tourist spot due to its buildings’ notable architectural styles, the numerous cultural events it hosts, and its scenic beaches. 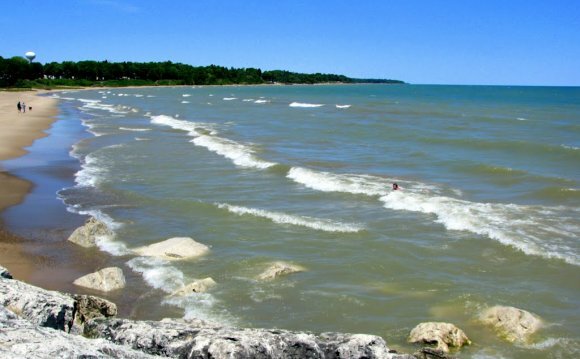 Dubbed “America’s Emerald Isle” due to its large number of Irish descendents, Lake Michigan’s largest island has sandy beaches and hike-ready forests, but it’s biggest claim to fame is its past history as the home of a Mormon monarchy. James J. Strang, who founded the Church of Jesus Christ of Latter Day Saints, and his followers (Strangites), founded the town of St. James here in 1848. Strang declared himself king of the Strangites until he was shot in the back by two disgruntled followers in 1856. Irish immigrants eventually drove out the Strangites, turning it into a fishing town, and both its Strangite and Irish histories are now commemorated at The Old Mormon Print Shop Museum and the Marine Museum, respectively. 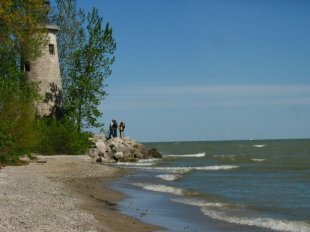 Ontario’s Pelee Island is the southernmost populated point in Canada and the largest island in Lake Erie. Due to its Mediterranean-like climate, the island has the perfect conditions for grape growing and boasts the largest estate winery in the country, covering over 600 acres. The island is also an important stop for migratory birds each spring and fall, making it a popular spot for birdwatching. Fall and winter pheasant hunts are a tradition that began in the early 1900s to curb the island’s burgeoning population of the birds, and draw hunters from all over.